I noticed my first pregnancy in late December. 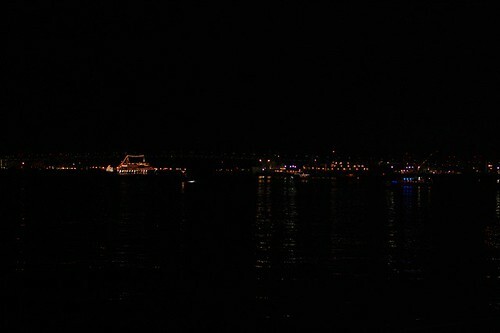 Soon after that, I felt sick and became unable to do almost everything. My boyfriend began cooking and doing everything for me. We had been waiting two years for our baby so we are very happy now. 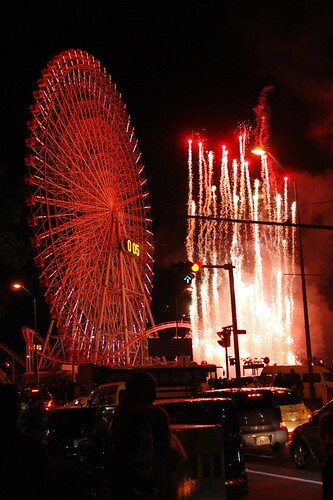 These days, my condition is getting better and can eat much more things than before. 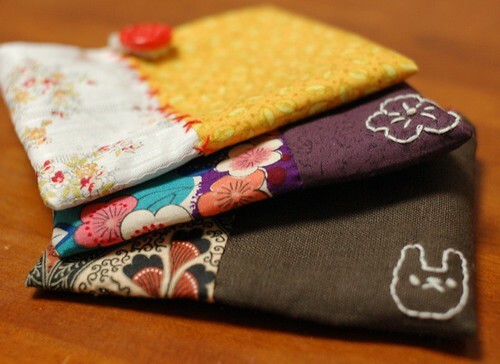 So I think I could make new items and update this blog more often soon. Now I'm preparing my new give away to share my happiness with you. Please wait for a while. Last Friday, we went to the hospital and saw our baby. It's just 1 inch long (* v *)!!!! Now I call my baby "Tomato", because it's the best food for me. 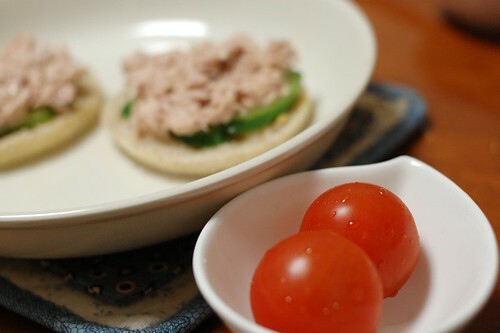 Even when I couldn't eat any other foods, I could eat only Tomatoes. I enjoy my days with "Tomato" in me. Thank you very much for all your comments on my blog. I'm reading them one by one and whenever I read them I feel very happy (* v *). 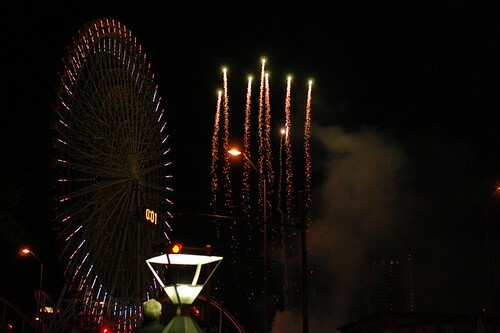 Thank you again!!!! But it's easy to make. You need only two patterns, one for the outside, and the other for the inside. 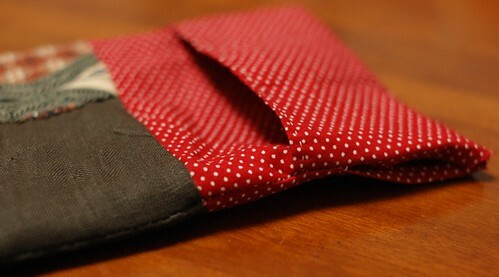 I patchworked the outside fabric, but you can make it with one piece of fabric too. 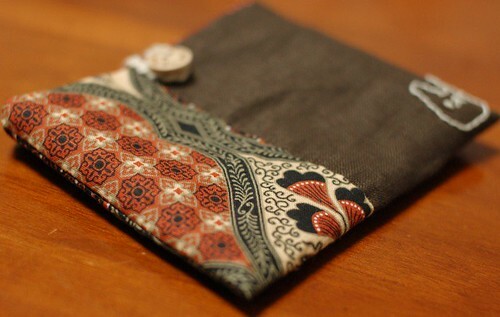 This pouch has a pocket in it and it's from a piece of inside fabric. So the patterns are only these two. 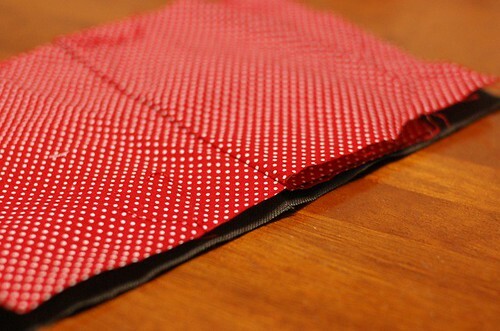 *5 inches x 8 inches + allowances, for the outside (I patchworked two pieces and then cut in this size). I put 0.5 inches allowance for each edge. 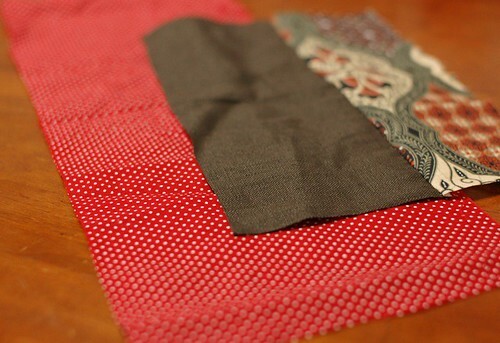 At first, I patchworked the outside fabrics. I cut them roughly and sewed them together. 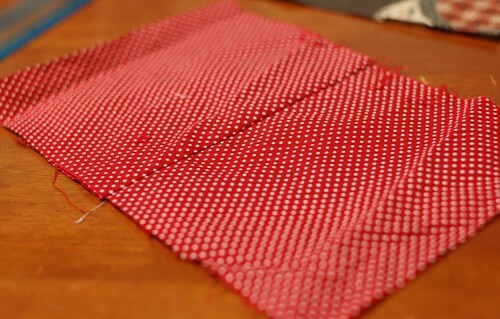 Then, put the pattern on the wrong side, drew the line and cut with 0.5 inches allowances. 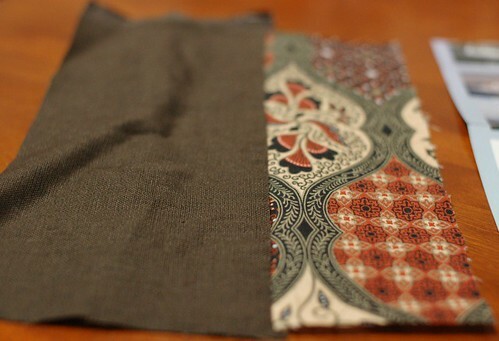 Cut the inside fabric too, with the allowances. 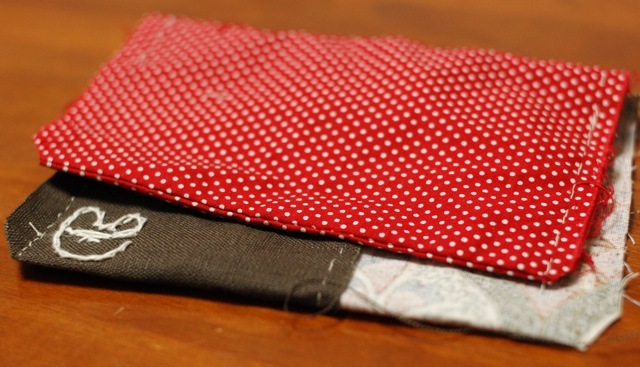 Fold the inside fabric in half making the right side up and sew 0.5 inches from the folded edge. 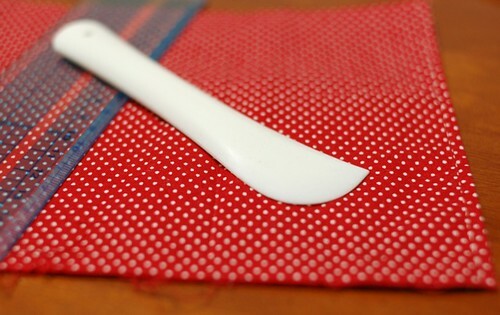 To sew the pocket line, I drew the line with this spatula(?) for marking. 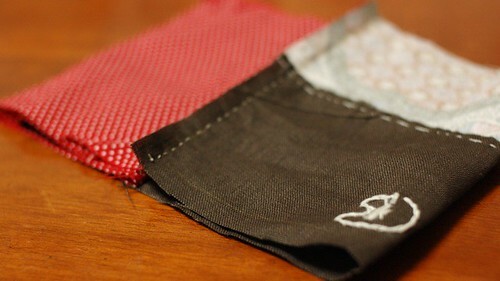 Draw a line at 2.75 inches from the folded edge. Open it like the picture. 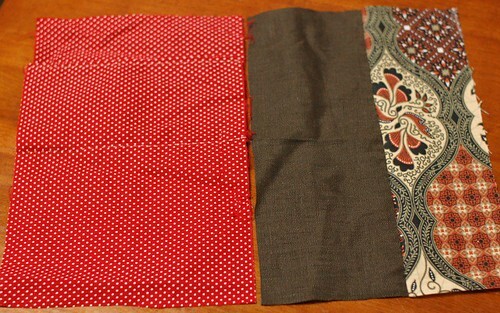 This is the wrong side and the size should be almost same as the outside fabric. 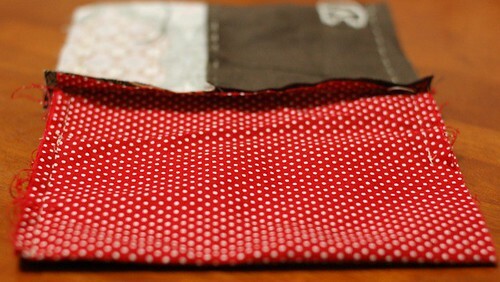 I put the outside and inside fabrics making the right side upside. 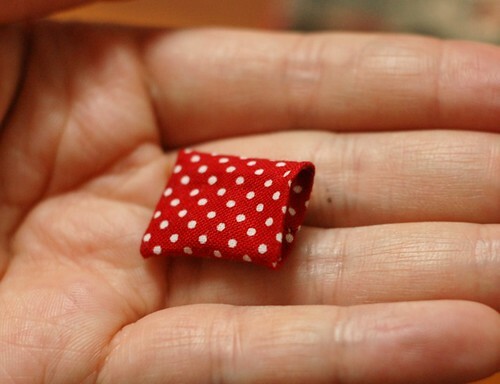 The inside fabric has a pocket. 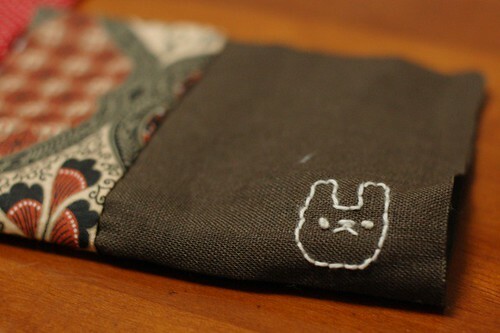 I hand embroidered a rabbit on the outside fabric. If you want to decorate outside fabric, please do it now. 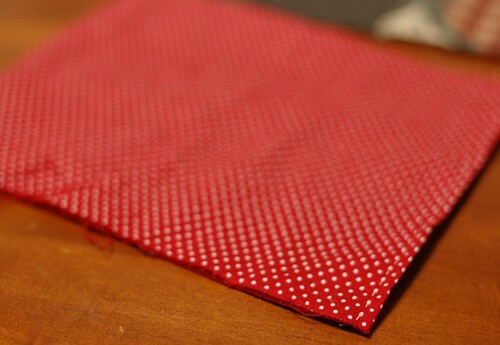 Put the inside fabric on the outside fabric facing the right sides. 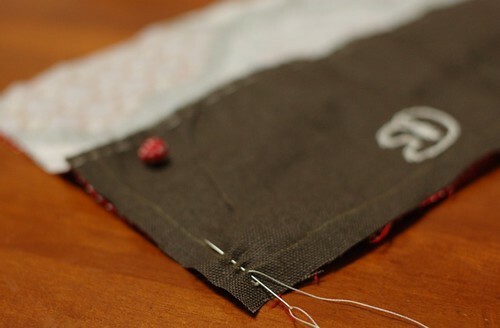 Sew the shorter lines like the picture. 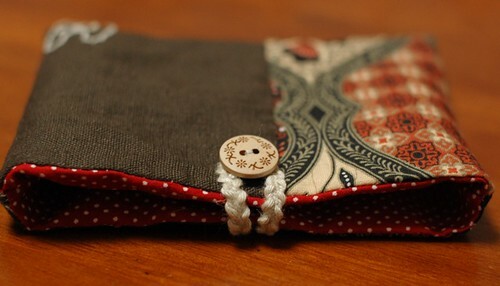 And refold it like the picture, putting the sewed lines center. 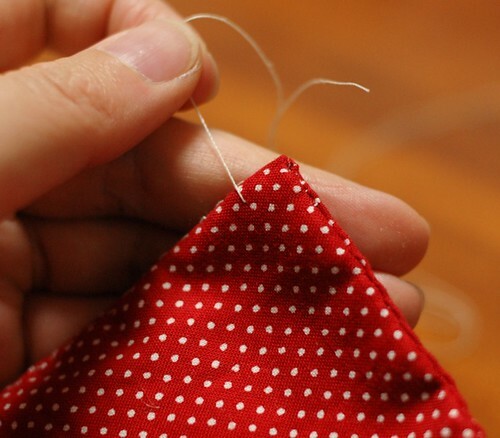 Sew the side lines leaving a space (to turn it out) on the inside fabric. (In this picture, I left a space at the lower right. 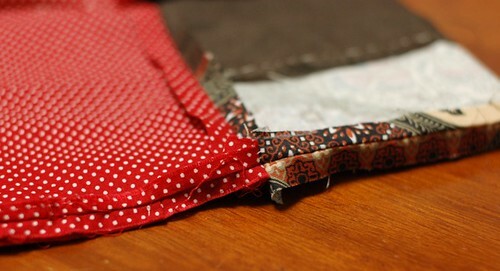 For making beautiful corners, cut the allowances of every corner a little like the picture. Also, for the beautiful shape, open the allowances and iron it. Turn it out. 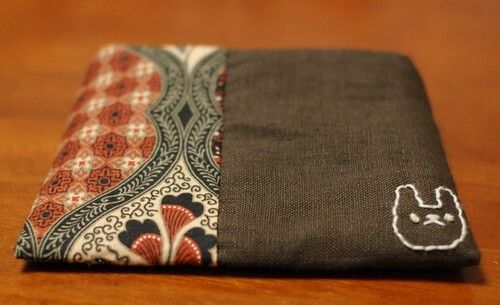 It has a pocket like the picture! 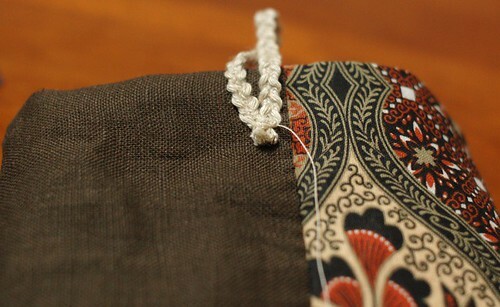 Close the space with blind stitch. You cannot see the stitched line from the outside so please don't care if it would be not so beautiful. 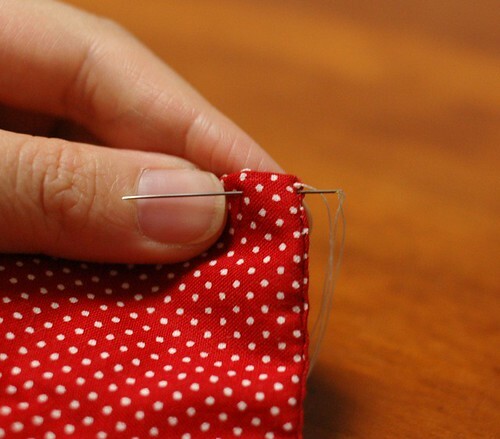 Make a knot and put out the needle at 1-2 inches away from the knot(See the picture). 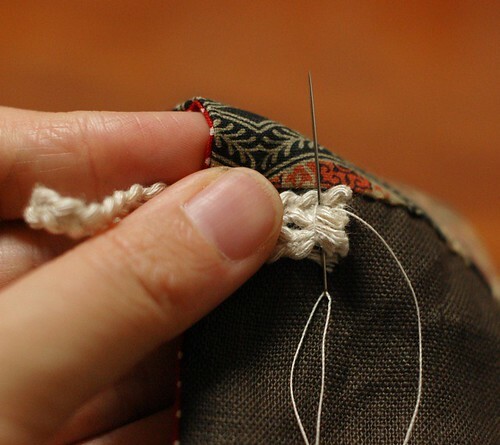 Pull the thread strongly and hide the knot inside. 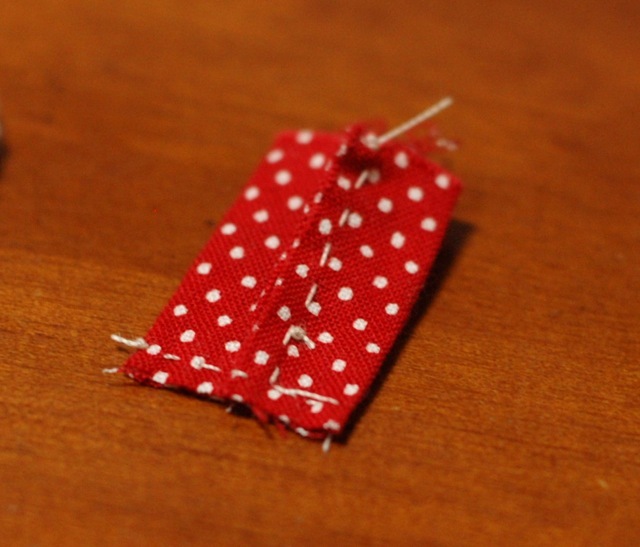 and cut the thread. I hide the end knot in this way (* v *)!!!! 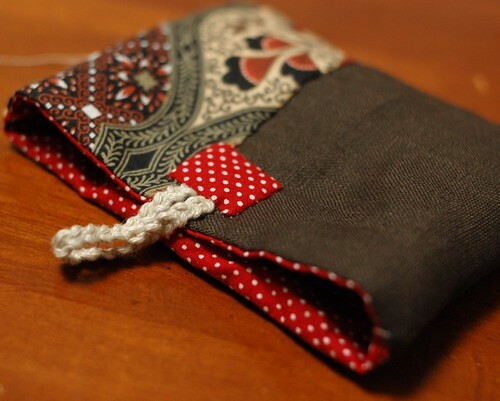 You made the pouch with a pocket! Then you only have to put a button and a loop. 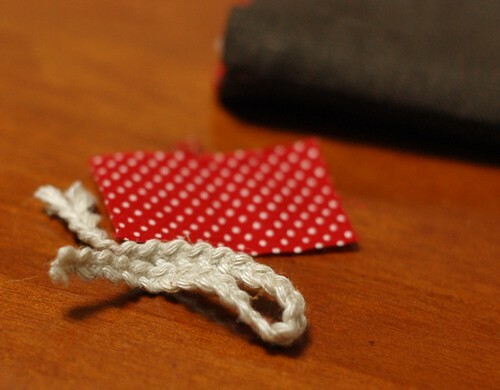 I made the loop with a linen code and a piece of fabric. 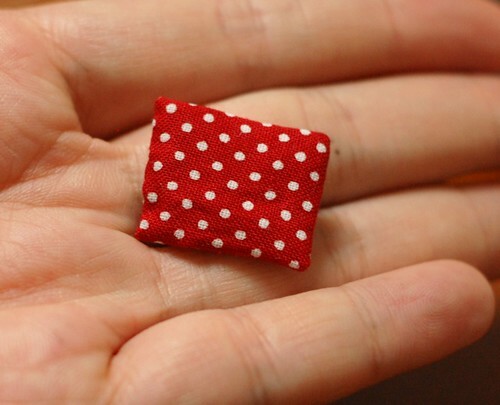 The piece was 1.5 inches x 2.5 inches(I didn't make a pattern for it, I'm sorry). The code was approx. 6 inches long. 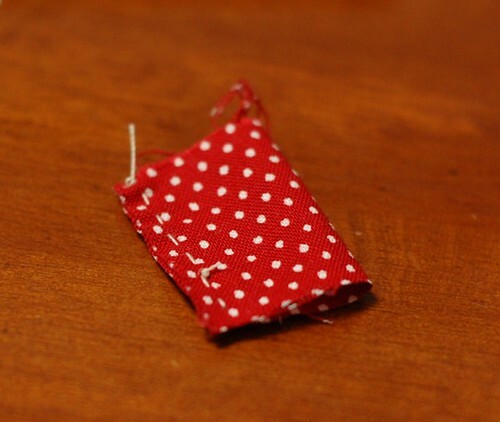 Fold the piece in half making the right side inside and sew a line like the picture. 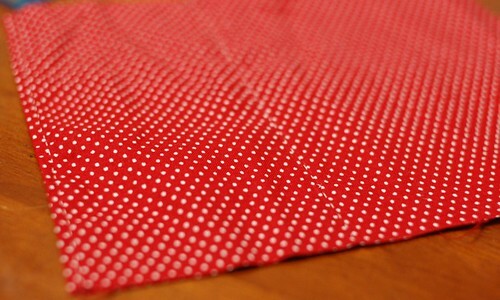 Refold it making the sewed line center and sew a line like the picture. 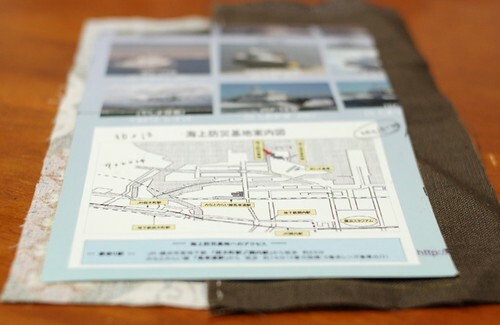 Turn it out and fold the allowance of the remaining side inside. 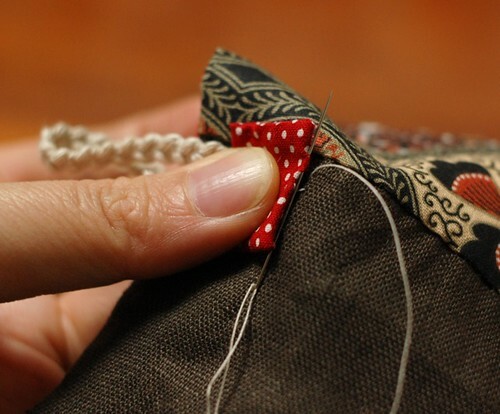 Close it with blind stitch. 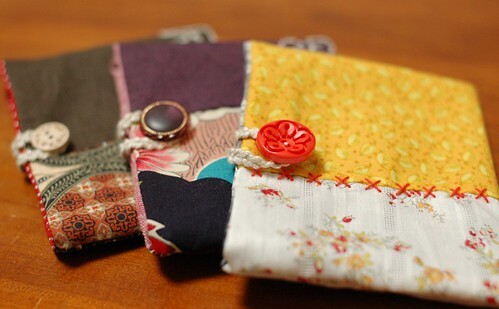 Sew the code at the center of the pouch on the back side, 1 inch from the top (In my case, the embroidered side is the front side). I didn't cut the thread and went on to the next step. 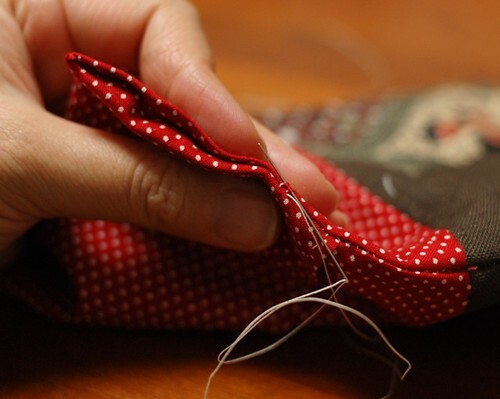 Put the piece what you made on the code and stitch it with blind stitch to hide the edge of the code. You finished to put the code! Put a button on the front side. You did it!!!!!! I'm sorry for the long explanation. If you have any questions about it, please write me.